Paparazzi Accessories is full of options on how to make money as a consultant, can I get a hallelujah?! I don’t like being boxed in to only one way of doing things. In fact I hate it. I am an out of the box thinker, I like to test the limits, to push right up against what is acceptable. And in Paparazzi I CAN DO THAT! Yay! 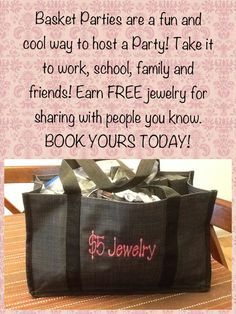 We sell our jewelry at traditional home parties, at one on one meetings, at events, out of the back of the car, and oh man, anywhere we can think of, even yardsales! One fun and really easy way is a basket party- sometimes called a bag party- either way, same thing. This is a training video I made for my Paparazzi Accessories team, Team WISE on how to put together a basket party and make it successful!